VertaseFLI was employed to remediate a former industrial estate in Kidderminster to enable redevelopment for residential end use. The works included: tree and vegetation clearance, excavation and removal of Japanese Knotweed infested soils from the canal bank, reinstatement and stabilisation of the canal bank, construction of an artificial badger sett and the installation of an ecological zone including seeding and planting. The main challenge of the project was the proximity of the Staffordshire and Worcester Canal, which formed the Northern site boundary. All works along the canal embankment had to be agreed with British Waterways. The Japanese Knotweed was carefully excavated down to the level of the water within the canal and exported to a suitably licensed disposal facility. 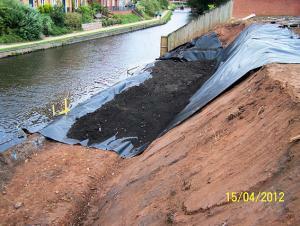 The reinstatement of the canal bank commenced with an impermeable liner to act as a root barrier and prevent regrowth of any rhizomes remaining below canal water level. A geogrid was then incorporated as the embankment was reinstated in compacted layers. Artificial badger setts comprising four chambers with individual entrances and link tunnels were constructed as the embankment was reinstated. The embankment was hydroseeded and the area around the badger setts screened by planting trees and shrubs to provide foraging and cover for the badgers. 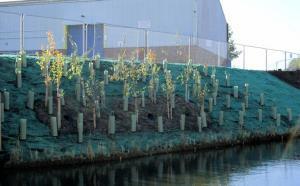 The installation of the ecological zone comprised pre planted coir rolls at the waterline, cellular geotextile dressing on the slope, hydroseeding and tree and shrub planting to afford foraging and cover for the badgers.